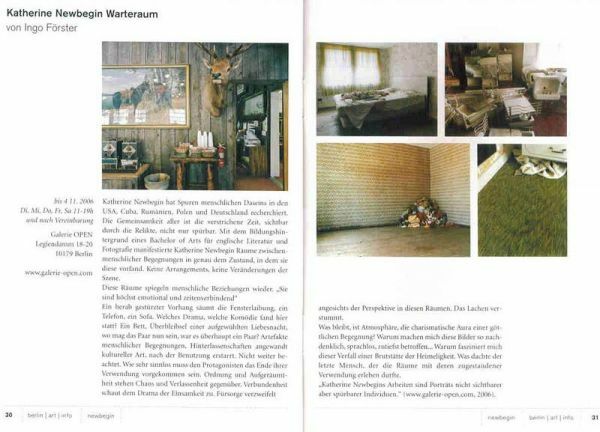 Katherine Newbegin has researched traces left behind by human presence in the USA, Cuba, Romania, Poland, and Germany. The commonality among them is the elapsed time, both palpable and visible through the relics. With an educational background of a Bachelor of Arts in English Literature and Photography, Katherine Newbegin reveals spaces of interpersonal encounters in the exact state in which she found them. No arrangements, no changes of scene. These rooms reflect human relationships. “They are highly emotional and tied to specific periods of time.” A fallen down curtain lines the window frame, a tin telephone, a sofa. What drama, what comedy took place here? A bed, the remnant of a stormy night of passion—where are the couple now, was it even a couple? Artifacts of human encounters, legacies in an applied cultural form, solidified after use. No further notice taken. How senseless the end of their use must appear to the protagonists. Order and tidiness stand opposite chaos and desolation. Solidarity watches the drama of loneliness. Care despairs when faced with the perspectives of these rooms. Laughter becomes silent. What remains is atmosphere, the charismatic aura of a divine meeting. Why do these images make me so pensive, at a loss for words, deeply affected…why am I fascinated by this deterioration of a breeding ground for homeliness? What was the last person thinking of, who was allowed to experience the rooms in their meant function.